An Oratorio to Latin texts from the Holy Scriptures and the Catholic Liturgy for soloists, choir, organ and orchestra. The work was first planned in 1853 and composed bewteen 1862 and 1866. Father Theiner, archivist at the Vatican, offered him the chance of accomodation in the convent of the Madonna of the Rosary on Monte Mario, which at that time still lay outside Rome. Liszt moved in on 20 June 1863 and was installed amongst the Oratorians with his piano, harmonium and a few items of furniture in two small cells. There Pope Pius IX paid him half an hour's visit on 11 July and insisted on hearing him play. When composing this work Liszt was able to draw on earlier works: one of these was the Seligpreisung of 1859 (possibly begun in 1855) written in Weimar to a German text and performed on 2 October 1859 in the main church of the town. The other was the Pater Noster I, written in or before 1860 and published in 1860 and 1864 on its own. He had begun work in 1860 on a Stabat Mater, a composition which he was to use again in 1878-79 for the Good Friday composition Via Crucis for choir and organ. 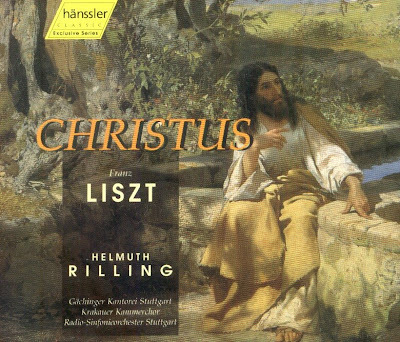 The complete work was first performed on 29 May 1873 in the Protestant church in Weimar, known as the Herderkirche after one of its distinguished preachers, under the direction of the composer and in the presence of, among others, Liszt's daughter Cosima and her second husband, Richard Wagner. The performers numbered three hundred and were drawn from Weimar, Erfurt , Jena and Sondershausen. Shortly after the Weimar premiere it was also heard in Budapest, in the assembly rooms in Pest, on 9 Nevember, conducted by Hans Richter, who was Hungarian by birth. Some sections had already been performed in Rome in 1866: the first part, the 'Christmas oratorio', was conducted by Giovanni Sgambati on 6 July 1867 and by Anton Rubinstein on New Year's Eve, 1871, a successful performance with none other than Anton Bruckner on the organ (!). During Liszt's lifetime it was performed ten more times, mainly in Germany, for instance in Berlin in 1881 under Alexis Holländer, but also further afield, in England and Hungary. But after 1914 it virtually disappeared from the repertoire. The first recording was made as late as 1970, with Hungarian performers. In 1986 large sections of the oratorio were arranged choreographically together with the 'Chorus mysticus' from the Faust Symphony, and performed as a ballet in Györ, Hungary, under the title 'Jesus the Son of Man'. The 3 CD Set was released by Hänssler Classic, 1998 (DDD). hänssler CD 98.121.